In this week’s edition of “Oklahoma Sheriffs – The Sooner State’s Most Corrupt Institution,” we visit Nowata County in far Northeastern Oklahoma. 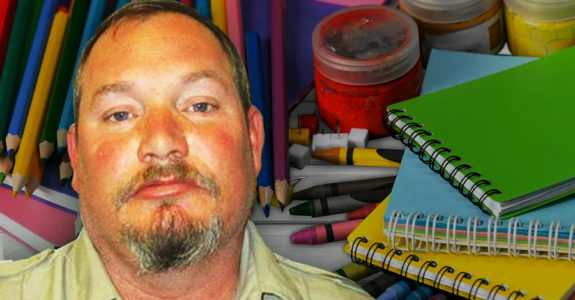 Earlier this week, Sheriff Kenny David Freeman was charged with embezzlement for using $6,000 in donated school supplies as giveaway items for his own campaign. Nowata County’s recently appointed sheriff allegedly embezzled about $6,000 in school supplies to, in part, support his own election campaign. State authorities arrested Nowata County Sheriff Kenny David Freeman on Wednesday on one charge of embezzlement, according to court documents. Freeman, 43, allegedly distributed the supplies at local events, including a local fair and at one point at a campaign booth, District Attorney Kevin Buchanan said. “It appears he was using it for his campaign for sheriff,” Buchanan said. The Walmart in Bartlesville prepared donations for seven area schools, including Nowata and South Coffeyville. Buchanan said the other five schools received their supplies. The donation to the seven schools was valued at $25,400. A Walmart employee told investigators that, because it was the Sheriff’s Office picking up the donations, she “gave them extra,” according to the affidavit. Buchanan estimated the value of the embezzled supplies was about $6,000. A witness, one of the Walmart employees, told investigators she saw coloring books, lunch boxes, crayons and markers at the Sheriff’s Office booth at the county fair. “She said she recognized the items as she’d just handled them for markdown the week before,” investigators state in the affidavit. Wow. What a nice guy! He decided to cut out the middle-man (a.k.a. teachers and school districts) and just give the kids supplies directly from his campaign booth! If only other Oklahoma sheriffs were that noble. I bet during the Nowata Sheriff Department Food Drive he keeps some extra canned goods in his cabinet for when his poor friends come over for dinner! Anyway, you can read more about this fiasco over at The Tulsa World. According to their report, Freeman is free on $2,000 bail. Let’s hope that he pays all his legal bills on time. The last thing he would want is to be extorted by bill collectors from the Oklahoma Sheriffs Association. Why does Oklahoma have so many corrupt and incompetent sheriffs? Why does Oklahoma choose county sheriffs by having them compete in low-turnout primary elections? The Republican candidate is a near-lock to win the general election, especially if he’s an incumbent. Term limits for county sheriffs would be a good start. Reforming the whole selection process would be much better. How about hiring the candidate with the best credentials and character references instead of the one with the most campaign money from the “right” political party? This guy is a Democrat, according to the Tulsa World, was appointed, not elected. What could possibly go wrong? He never could have gotten into office as a Democrat through the election process. And apparently Nowata County has no sensible selection process because they never had to appoint a sheriff before. I don’t think it’s an Oklahoma problem. A lot of small town sheriff’s are corrupt simply because of the amount of power they have combined with a lack of oversight. Oklahoma Sheriffs offices seem to be part of the retirement system for retired DPS troopers. Once they retire from Hwy Patrol they seek a county sheriffs position to gain more money in retirement and get to keep their guns and authority. Just look at the numbers serving now. The GOP will protect their own for sure. Hey! Hey! Hey! It ain’t stealin’ when your the Law! It’s “Confiscating”! If it’s legit to take wads of cash from people for no other reason than they’re carrying large wads of cash why should takin’ supplies from stores carrying large amounts of school supplies just cause they’re keeping large supplies be any different? This guy was appointed Sheriff, and back in August there were some concerns and a desire by the public to possibly have him removed from office. Some felt he hasn’t shown the “ability” or “skills” to be sheriff. The motion was tabled by the people who appointed him. And they say Chicago and Louisiana are corrupt, guess “they” have never been to Oklahoma. Cook County and Orleans Parish may be corrupt, but they still manage to get things accomplished. What we need is a better grade of crooked politician! Good Read……those County Commissioners should be sent to Prison! Well we indicted 110 of the county commisioners in 1981 in one of the biggest scandals involving local officials in the history of the US and apparently we didn’t learn a damn thing. There’s actually a movement to eliminate the office of the sheriff because it’s anachronistic (dating from the 9th century), not really accountable despite it being an elected office, and redundant in a time with professionalized local and state police. The state of Connecticut abolished the office of Sheriff in 2000. Be difficult to accomplish in a state the size of OK and using the county/municipal system. Elimination the sheriff, would leave all the citizens not located in a township, municipality, village or incorporated city without any form of policing other than state trooper enforcement. Also leaving very small towns/cities without a police force to use a constable or volunteer system, which typically fails due to the no/low pay and/or unqualified person who is tasked with the job. The guy deserves to be k7cked in the nuts.